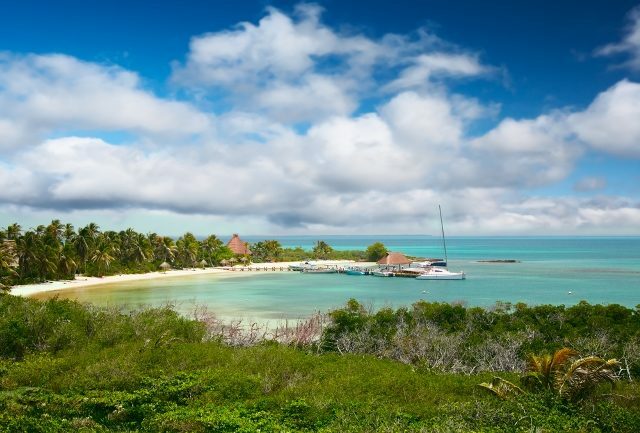 Enjoy Isla Contoy National Park - DestinosFun! Visitors flock to Cancun for its magnificent beaches, the luxury of its incredible resorts, a wide range of festivals and sporting events taking place continuously, an exciting and wild nightlife and many other things. But, truth be said, it is Cancun’s natural beauty that will make you keep coming back for more! The natural wonders of Cancun are as many as the ways in which you can explore them. You’ll reach a connection to nature that you’ve never experienced as before! From Cancun or Isla Mujeres, you can take a tour to the most important bird sanctuary in the Caribbean: Isla Contoy National Park. Is located in the state of Quintana Roo, in the imaginary line dividing the Caribbean Sea and the Gulf of Mexico. Sitting in the exact place where these two gigantic masses of water meet mean an abundance of marine life that is beyond imaginable and thus, a great habitat for birds too. Surrounded by mangroves and lush vegetation, lined with coconut palm trees, this movie set looking island invites nature lovers and adventurous souls to live an amazing experience. After taking an hour-and-a-half boat ride, you’ll reach this paradise island, which is one of the most beautiful Mexican National Parks. Isla Contoy is a small island (covering an area of 780 acres) only 15 miles North of Isla Mujeres. This is the amazing opportunity of watching wildlife in its natural habitat. Monkeys, birds, small mammals and plenty of vibrantly colored fish are only a preview of all that you’ll see in this magnificent ecological reserve. In land, the mangroves, low jungles and lagoons are home to 152 registered bird species (coming up to an average of 10,000 birds) which is just impressive for such a small area. They’re either migrant or resident species: they either call Isla Contoy their nesting area, or a way station between their Winter and Summer habitats. The easiest to recognise are the double-crested cormorant, the frigate and the brown pelican. Birdwatchers will be astonished for a while and then come again to their senses to enjoy the widest variety of birds living in a single place. Marine life is not only of the most varied but also clearly visible in the crystal clear waters surrounding the island. In the reef that’s only a few feet from Contoy, you’ll see manta ray, grudge, spiny lobster, snail and sardine. As if that were not enough, Isla Contoy becomes a safe haven for nesting to four species of turtles facing danger of extinction, every year from April to October. As a wise preservation measure, only 200 visitors to the island are allowed on a daily basis. Tours usually sail from both Cancun and Isla Mujeres, which is worth visiting too! If you’d rather self-tour the island, take into account a permission from the Park Authorities is needed. The Park features a visitor center with a pier, a gifts shop, a resting area with benches and the traditional palapas, a grill for enjoying yummy barbecues, a high panoramic viewing spot and, perhaps the best of everything, a brand new archaeological underwater museum! Don’t forget to bring a cap, sunglasses, bug repellent, a camera, binoculars and biodegradable screen (which is the only one permitted in all marine protected areas). Come and enjoy Isla Contoy National Park! A perfect attraction for your trip!